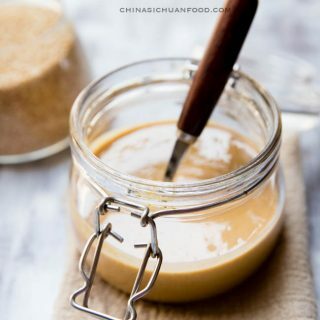 doubanjiang (豆瓣酱), the soul of Sichuan cuisine, is also known as broad bean paste. It is the essential ingredient for real Szechuan mapo tofu. Real Szechuan doubanjiang is full of flavor after long time of fermentation. You can search it in Asian stores or buy from Amazon. 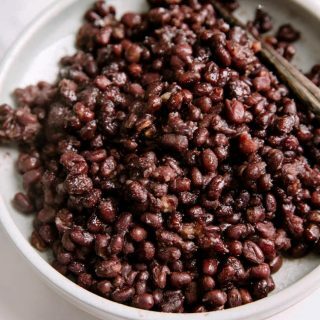 Dou-chi (豆豉) is also known as fermented black beans. You can try to get some from local Asian market or purchase some from amazon: Chinese Douchi – Fermented Black Beans – 16 Oz Bag Each . Freshly grounded Szechuan peppercorn powder (现磨花椒粉)is another important seasoning that highlights the dish. In almost every Szechuan style restaurants, they sprinkle freshly grounded Szechuan peppercorn powder before serving. But it is ok to skip this if you really do not like the numbing taste. But for Szechuan peppercorn lovers, do not skip this step. It will enhance your mapo tofu to another level. my simplified homemade version without freshly grounded Szechuan pepper. 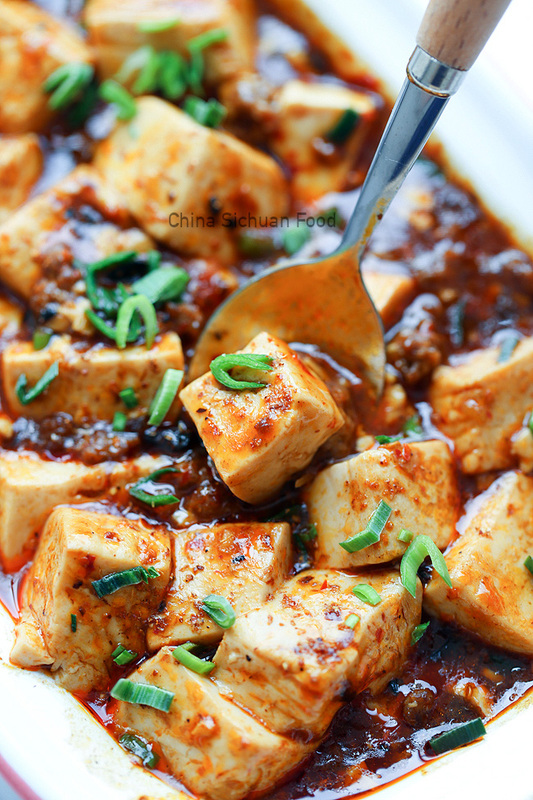 Famous Mapo Tofu Recipe From Sichuan Cuisine. Recipe video below. Stir the water starch and then pour half of the mixture to the simmering pot. Wait for around 30 seconds and then pour the other half. You can slightly taste the tofu and add pinch of salt if not salty enough. By the way, if you feel it is too spicy, add some sugar can milder the taste. But be carefully as the broth is very hot at this point. The doubanjiang may differ in salinity. So adjust the amount if necessary. Vegan readers, skip the minced pork or beef. And another choice is to replace the meat with mushrooms either dried or fresh ones to enhance the flavor. Mapo tofu with mushrooms. I love Mapo tofu every much. And may be I should try to make this one. I do love Mapo Tofu and will make your version soon. I didn’t know you could use beef too so will try it that way. Keep the good recipes coming, I am enjoying all of the ones I’ve tried. Love to see you again. Both minced pork and beef are ok for mapo tofu. Beef tastes better to me. And I am really happy to hear your feedback. I believe beef is the original one since lamb was not popular in Sichuan area previously. Great recipe. Yes original recipe calls for ground beef, since beef consumption is common in Sichuan. 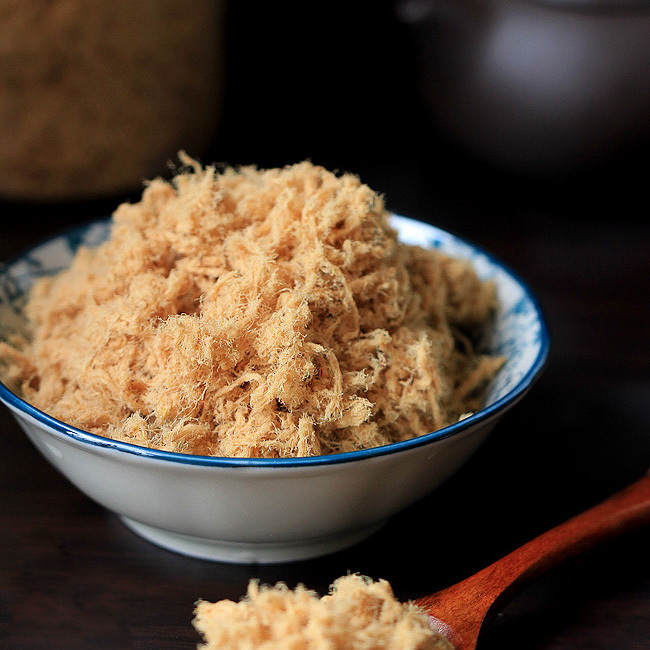 Also some would insist to only use doubanjiang from Sichuan, specifially from Pixian 郫縣 area. 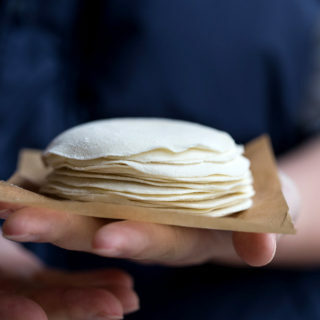 Sometimes we do the simple version mentioned by you, using any doubanjiang for a homemade quicker version. Hi, love your recipes. My wife being from mainland china i travel quite a bit in china. Sichuan style recipes are my favorite due to the spicyness. Though i do love the beijing style cooking. I just love spicy. Mapo tofu is one of my favorite. Thanks for commenting Will. Glad to know that you love spicy food too. Hope you enjoy! I’ll have that one tonight! I guess we don’t eat the peppercorns ? Can we sprinkle peppercorns powder on the top ? Thanks. Surely. That’s a lovely idea. Both powders and whole peppercorns can be used in this recipe. If you use peppercorn powder, just sprinkle at the very end because there is no need to stir-fry the peppercorns powder. Thanks for this recipe, I tried it and it turned out great! However, as you may be able to see from the photo, I dont seem to have as much of the nice red sauce to go along with it. The pixian doubanjiang I bought seems to be more thick than saucy, so should I perhaps add chili oil to compensate, or is there a different liquid that would be better? I tried adding a bit more water but it didn’t seem to do that much. Thanks for posting me your photo and trying my recipe. It is my fault, I forget to add water or broth in the instructions. I am so sorry and I have updated the recipe. If the pixian doubanjiang you are using is thick, add more oil and stir-fry the doubanjiang with low fire for a while. Then you will see the red oil coming out. I am using home-made red oil doubanjiang, which contains a small amount of red oil. Thanks for correct me honestly. I love this recipe and your site in general. I have also made your stuffed aubergine recipe which was delicious. Thanks so much for the great recipes! Thanks Alan for your lovely feedback. Hi there. You’re recipe looks amazing! In fact in the middle of trying to make it but ran into a problem. You mention soy sauce in both the description and instructions however there is no measurement of soy sauce listed in the recipe ingredients. Please help. Thank you! Hi Elaine! You’re the best! The dish turned out AMAZING! Better than any version Ive had in a restaurant. I also want to thank you for sharing the link for the harder to find ingredients, that was so incredibly helpful! Ive printed out several other of your recipes that Ill be trying out over the next few weeks. I love your site so much! Thank you again! Thanks for the feedback. I am so glad that you love my version too because that’s a dish I feel quite proud of. And mapo tofu really is my ideal dish–quick, simple, and supper yummy. Go ahead and try other ones. I really hope you will love them too. 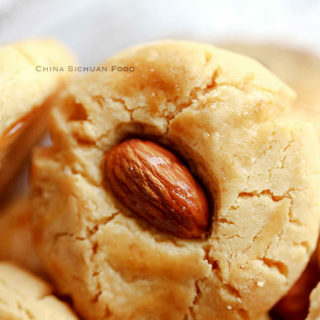 I tried this recipe and even got the “real” doubanjiang from Amazon labeled “Sichuan / Pixian / Pi Xian Broad Bean Paste”. It tastes good but I think it was a bit too salty> I did use 1 1/2 tablespoons as your recipe calls for. Did I do something wrong? I did not add any salt. In the past I have used a different recipe and instead of the Doubanjiang I used Gochugang (Korean) chili bean paste which is sweeter. I also add to rice wine, sesame oil and sugar to the sauce. Thanks for the feedback. As for the salty taste, it may caused by the soy sauce or maybe we have different standard for salinity. Next time, reduce the amount of Doubanjiang or use salt reduced light soy sauce. I just found your website 2 days ago while googling for MaPo Tofu recipes. Just tried your recipe today… It was awesome! I’ve made this dish relying on leekumkee premade sauce…I don’t think I can ever go back after trying your recipe! thank you so much for sharing. I grew up in Hong Kong but have lived in California for many years now. Your recipes remind me so much of home! Where I live now (San Diego) it’s hard to find good authentic Chinese food. 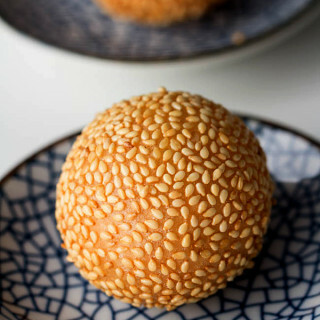 Im so happy to find a website with recipes for bolo bau, egg tart and chive cake all at one place. Your website inspired me to try making the food I’ve missed so much myself. I’m steaming a turnip cake using your recipe as I type this comment. I hope it turns out well! My husband and friends would have you to thank for many (hopefully) good Chinese food to come! Thank you so much Elaine! keep up the good work! 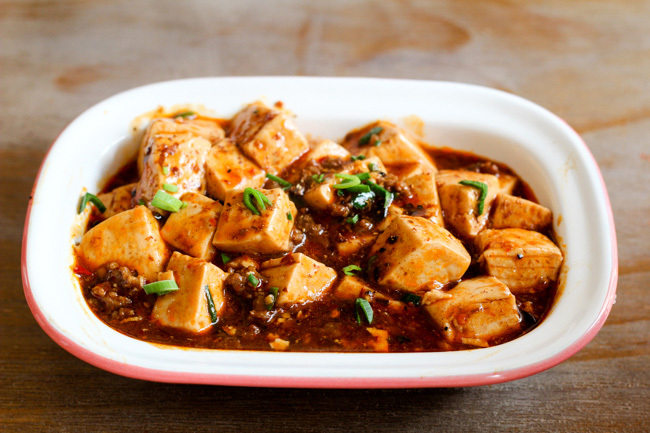 Thanks so much for your feedback about this mapo tofu recipe. I am so happy to know it works out great for you. I grew up in Sichuan province and then living in Shenzhen. I visited Hong Kong a lot during weekend since it is quite near and there are so many yummy food. As a foodie, I am always trying to find yummy stuff and to understand how they are cooked. And sharing makes all the process much interesting and challenging. I will bring more tested yummy recipes and hope you happy cooking ahead. I am going to try this dish tomorrow. Wish me good luck. Great Kumar, look forward to your good news. 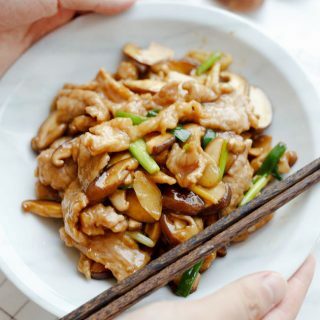 Great recipe tried it today and we loved the taste, will be trying the mushroom version tomorrow 🙂 living is a small country town we done have a lot of exposure to authentic Chinese food so it was just a stroke of luck I cam across your site. Also managed to get the authentic doubanjiang from China (well the one that’s matured for 2 years any way 🙂 it’s made a big difference to the taste instead of using the “lee Kim kee” pre made sauce which is full of presertives and flavour enhancers. Thanks for the feedback. I am super glad that you love it as me too. It is real that authentic doubanjiang is the soul of real Szechuan style recipes. I get many reports of using Lee Kim Kee previously but amazed by the real tastes of authentic doubanjiang. You are really quite lucky! Happy cooking ahead. Another great recipe from you! This dish is so delicious and its especially good with a warm bowl of rice! Yummy! We live in the US and getting the ingredients was a little difficult but my husband did it! Thank you for the link to Amazon.com to buy the doubanjiang A healthy and delicious dish! A must-try! Thanks Grace and Ezekiel for the wonderful feedback!!! I am so glad to hear that you like this too because Mapo tofu is really my favorite dish especially when served with steamed rice. Thanks Kim. Glad you like it. This is a dish I am quite proud of. Enjoy and bon appetite. Hi Elaine, I just ran across your blog. I spent a few weeks in Xi’an China last year and just fell in love with the food. I was determined to learn, but something more like Sichuan silt, and got a copy of Fuchsia Dunlop’s cookbook which helped learn the ingredients, techniques, etc. for a non-Chinese speaker. But I have kept looking for authentic recipes and just found your blog. Tonight I tried Mapo Tofu and Sichuan Eggplant and both were absolutely fabulous! The whole family said they were the best they had ever had! I will be trying many more of your recipes. Thank you for all the work that you do on your blog. The photos are beautiful too. Thanks Mike. I have been living in Xi’an for four years and I miss the food so much. I also have some Shanxi style food on the blog and hope you will love them too. My commonly used rice cooking wine is this one–http://amzn.to/1lnlyFu. It is a common Chinese cooking wine widely used in stir fry dishes. 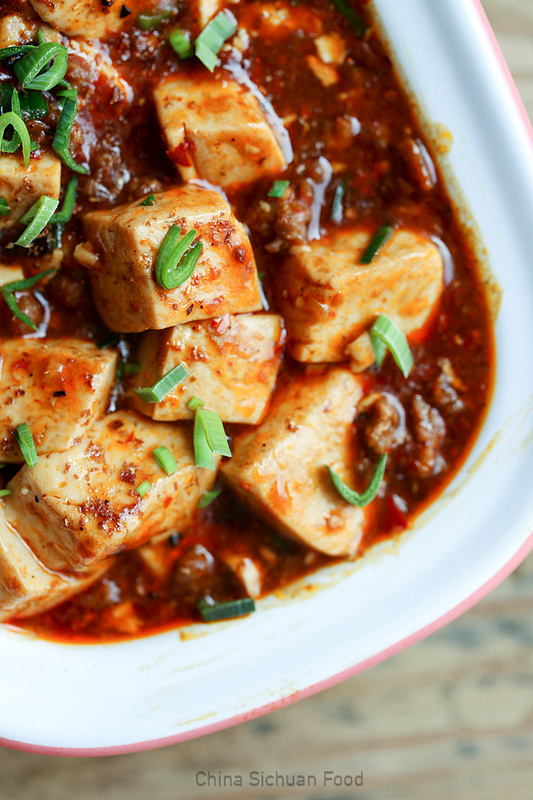 takes 20 minutes to make Mapo Tofu? amazing. it looks delicious. look! there is beef in the dish. I love it. I must try to do this dish tonight. amazing. tofu looks delicious. so cravings! I love beef. I must try to do this dish tonight. Yum! It came out perfect, Everyone loved the Mapo Tofu. Bookmarked for future reference. You’ve got 1/2C minced/ground beef listed twice (once near beginning and once near end) in the recipe. But you only “stir fry” the beef once. Sorry Len. That’s a typo. We only need 1/2 cup minced beef. i think chopped scallion white is missing in the instruction. When do we add them? Chopped scallion white should be stir-fried with garlic and ginger at the beginning. I’m glad you love this recipe, hope you succeed and enjoy cooking. Do you have a link to the previous version? It was great and simpler. Sorry Mark, I do not have a link to the previous version. I only add chili powder and cooked the tofu before frying. You can soak the tofu and skip the simmering step. Beef? Ugh….should always use pork. You can use minced pork, but beef version is more popular in Sichuan area. 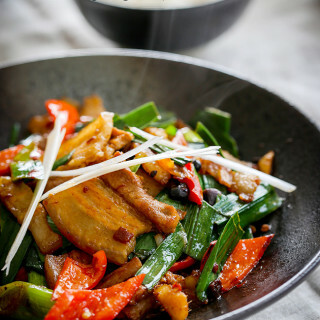 To be honest I eat tofu once and I didn’t liked so much… but this recipe looks delicious! I’m gonna try for sure! Awesome, It’s looks delicious. I will try to cook next weekend. I am going to share on Pinterest and Bookmark. Really very nice recipe post. Tofu with sticky rice are my favorite. I love the recipe. Thanks for sharing this. God bless. 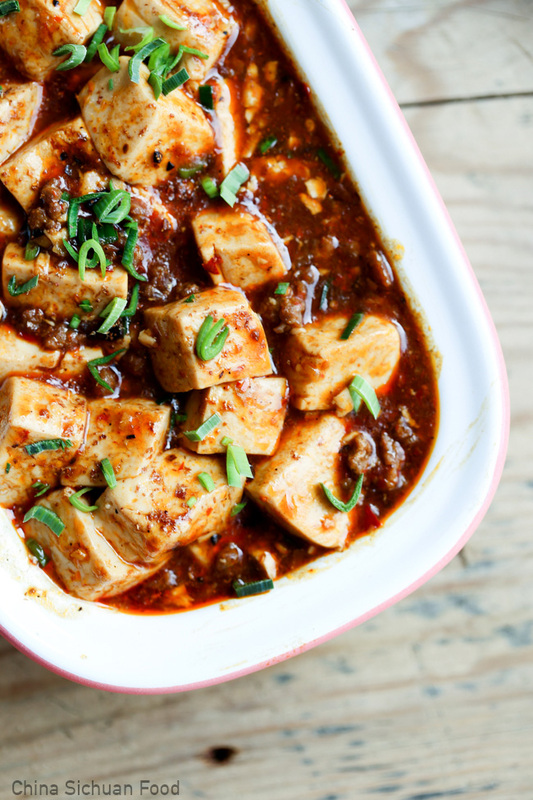 Mapo Tofu can be found in almost any Chinese restaurant around the world with hundreds of variations adapting the piquant original to suit local tastes. my mouth is getting watered after seeing the pictures..
thanx for sharing a great post!!! Thanks Tom for such an encouraging comment. I will bring more yummy and interesting Chinese recipes on the blog. Stay turned and happy cooking. 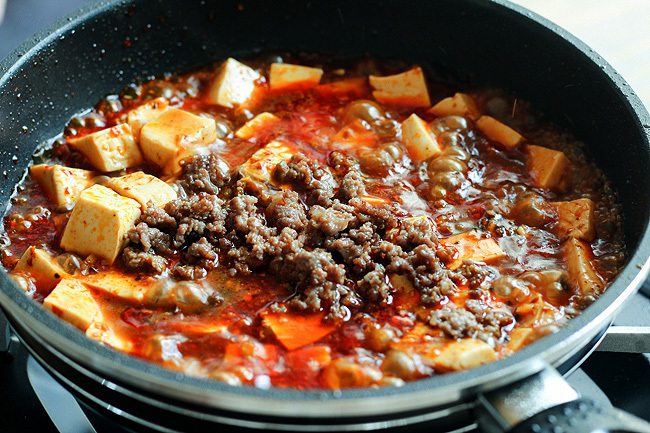 Mapo Tofu is one of my most favorite dishes and this is a very very nice recipe for the dish. You are the most welcome, Dogan! Thanks for such a delicious and easy recipe Elaine! I’ve tried another mapo tofu recipe that was not very successful, but when I saw your recipe, and how I already had all the ingredients at home, I decided to try making it again. It was a HUGE hit with my wife, and it will be on my regular dinner rotation! ? Keep up the good work! Thanks Paul for this encouraging comment. Happy cooking! Hi Elaine, thanks for sharing. very detail receipt and awesome picture you take, I like it very much. I’ve made this a few times and it’s absolutely delicious! Mapo Tofu is my comfort food when i don’t feel great, or i know a cold is coming. So much better than the local Chinese-American restaurant version. Glad i found this site, and looking forward to trying some of your other recipes. Thanks Ksenya for this wonderful feedback. Hope you get good results with other recipes too. Happy cooking! I made this tonight for the family and WOW!! Delicious… better than any restaurant I’ve tried here in the states. Loved it!!! 5 stars!!! Thanks Neal! This comment really can make my day. Usually restaurants use more oil when it comes to stir-frying and braising in Chinese cooking. 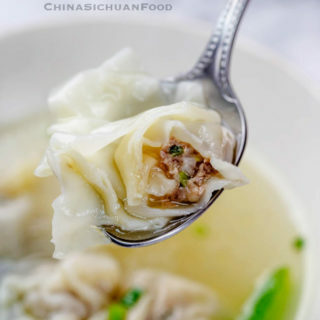 If you visit a Chinese family, you will find that homemade Chinese dishes are much healthier and lighter than restaurant versions and in most case, more delicious! Happy cooking and enjoy your food. I was looking for mapo tofu recipe and chanced upon your site. So, loved it. I told my mom to try it. The way she taught me was just put doubanjiang . But yours have fermented beans which added a new layer of flavor. Loved this, looking forward in trying your other recipes. Thank you Mushu. Though we do not need too many fermented beans, but they are quite important to the final flavors. Happy cooking! I made this last night, but with no meat and eggplant instead of tofu! It was delicious. The eggplant is a nice substitute if you don’t have any tofu at home. I’ve also made it the original way with tofu. Maybe next time I will try it with both! Thank you for the recipe!!! Haha, what a brilliant idea to use eggplants!!!! We love to use eggplants to replace meat in all types of buns, pies and pancakes. I will try this version too. The eggplants should be super great! This recipe is fantastic. I live in a small town that doesn’t have any decent Chinese food. I’ve been desperate to find a way to recreate some of my favorite foods and finally with this recipe I was able to with out driving several hours to a city to get good food. Thank you so much! Thank you, Taylor for trying my recipe and your wonderful feedback. Happy cooking! Nihao. When I read your post and saw the photos, I missed China very much. I live at Temple in Hubei for half the year, and the other half year live in US. I am in US for this half year, and am missing eggs & tomatoes, and mapo tofu, and biang biang mian, and qiezi, and the food I have become accustomed to while wandering China. Your recipes and photos make me look forward to returning after the new year. Thank you for such wonderful gifts. Thank you, Cheng. I sincerely hope that all of my recipes can help you reproduce those yummy memories back in your US kitchen. Happy cooking and I am looking forward to your good news. Hope you will love it, Jimy! Hi Elaine. Just discovered your blog. Nothing wrong with being late to the party, as long as it keeps going. 🙂 What a fun and delicious recipe! I made this last night. Thanks to amazon and Asian markets here in the Pacific Northwest where I live, finding ingredients is very easy. Thank you for creating this site and sharing your love of food and your culture! I look forward to exploring more of your recipes. Thanks Mike. I am so glad to have nice readers like you. I hope you will love my recipes and enjoy your time in further cooking. Thank you for trying and the lovely feedback. 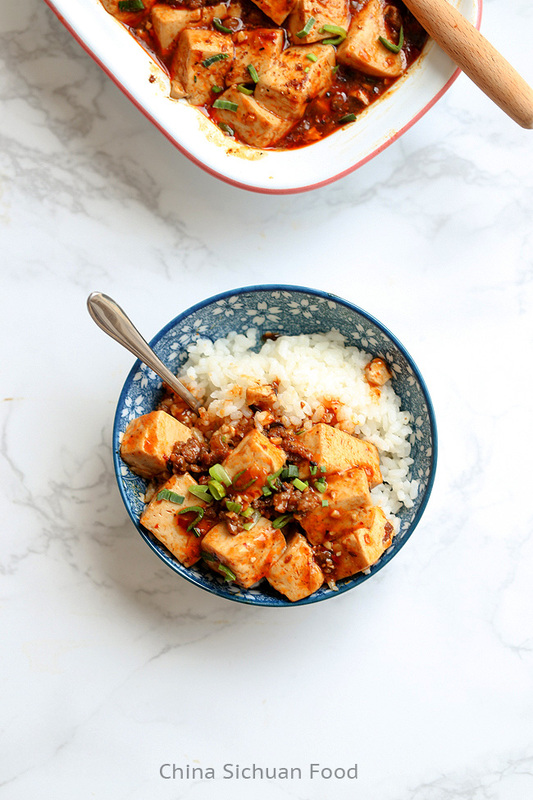 Mapo tofu is one of my favorite foods in the entire world, and this recipe makes a fantastic mapo tofu! Thank you so much for sharing it! You are the most welcome! Followed your recipe literally, except for Szechuan peppercorn, which unfortunately I forgot to buy. Best * Mapo *Tofu * Ever, no question!! Thank you for sharing. Next time I’ll make sure I have the peppercorn but I can’t imagine it getting much better than this. Thanks. Mapo tofu is the best ever tofu dish on my list. I am so glad to know that it turns out great for you too. The recipe is awesome! Very delish!! 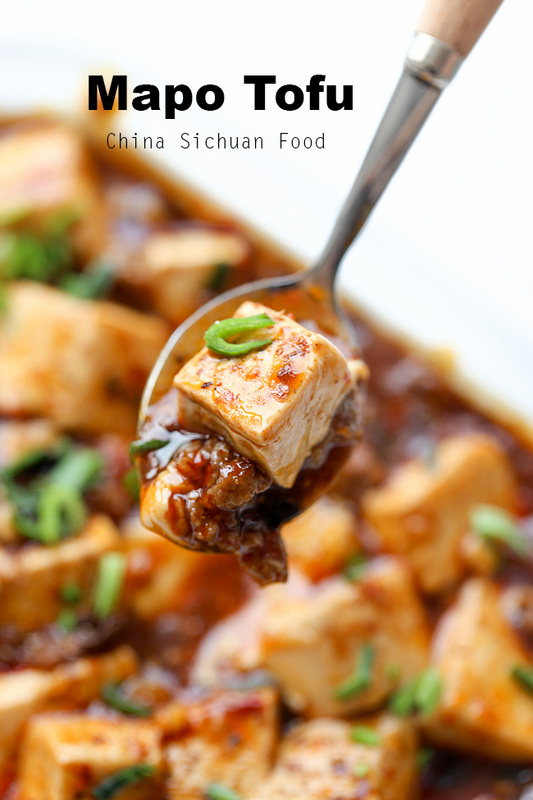 This is the most amazing mapo tofu recipe ever! Mapo tofu is my daughter’s favorite food, and now I can make the good stuff at home for her. It’s what we crave when we are sick, or tired, or just in need of comfort. I found your recipe and ordered doubanjiang and dou-chi, some fresh and strong Szechuan pepper, and made the recipe with lean ground pork and leeks as well as scallions. So happy I found your website, and I can’t wait to try many more of your recipes! Thank you!!! Thanks Catherine! That’s a comment which can make me a day. To me, mapo tofu is a comfort food too. I do not eat chili peppers a lot in daily life. But I really need to cheer myself up with some of my favorite dishes too from time to time. Happy cooking and I hope you will love my other recipes. My whole family adores you his receipe! We have it book marked and order your specific ingredients from amazon! Thanks so much! Thanks Jenny for such an encouraging comment. Happy cooking! You are the most welcome, Alex. Thanks Rachel for such an caring comment. This is my favorite tofu dish. I hope you will like it too. I made this tonight for my husband and me. He said it was one of my best dishes ever! Thank you! It tasted like I’d ordered it in a Szechuan restaurant. It took me a little bit of time to find the fermented black beans and broad bean paste in the huge international market near me, but thankfully both were there (in foil-like sealed packets) and right next to each other in the store. Thanks so much for such a lovely comment. I understand that dou-chi and doubanjiang might be hard to find outside China. But once accessed, you are welcome in the yummy heaven of Sichuan cuisine. I just want to say big thanks. I followed your recipes and my family really liked it. Now they mostly demand to make it more. Thanks again. Thanks Tom for the feedback. Glad to be helpful and happy cooking! My husband has literally begged me for this dish and it looks super amazing. The only problem is that we are gluten free and the amazon site says that Chinese Douchi – Fermented Black Beans – 16 Oz Bag Each has gluten inside. Could you recommend a gluten free brand? This seems to be gluten-free. You can have a try. I have been using this product for about two years now and, while it is not certified gluten free, It seems to be and I have not had any reactions. I am about to order another jar, because mine is old and a few months ago I did not find it on Amazon! It is delicious! Hello Elaine! I love this recipe! I make it very often. As a matter of fact, I am having mapo Tofu right now!I just wanted to share that while living in Malaysia, several years ago, because of their cultural diversity, some people don’t eat pork so I ordered mapo Tofu, expecting the traditional recipe and, to my surprise, and delight, the made it with chicken. I have same thoughts, this is on of the best recipe, Thank you Elaine. I too loved the recipe, Looking forward to try with my friends on this weekend. Just one question. Is it safe for kids above 10? You need to add steamed rice to the ingredients. I went step by step and as I finished step 9: serve immediately with steamed rice. Steamed rice takes 20 minutes to cook and I didn’t start until the recipe was finished :(. Hug hug Mike. This happens to me frequently too. Thanks for the advice, I have already update the recipe. Love this recipe, have done it with beef, pork or chorizo sausage; always a success . I think I will try it with mince chicken next. Thanks rené! You bring out brilliant ideas to use chorizo sausage. That version might be very special. Hi Elaine, your recipe looks great and I plan on giving it a go as I have all of the ingredients on hand save for the pepper flakes/ powder. It’s this that I’m writing to you about. I watched your video and read through the recipe but I don’t know what they are exactly. I have chili flakes of course, but what you are using looks less refined. Will the chili flakes work or is there something more precise I should look for? I have whole dried red chillies that I could just chop and remove some the the seeds if that would suffice..? Anyway, it all looks wonderful and I’m looking for a recipe that isn’t as involved as my usual go to. You are very caring when reading recipes. In fact, both pepper flakes or refined pepper powder can work for this recipe. Most of Chinese cooking is just based on your ready in pantry ingredients. There is no need to search for another more precise ingredients here. The pepper flakes I used in my video is slightly different from the one you can access to in your local store. We fry the peppers with a small amount of oil firstly before grounding which gives a strong aroma. But you can slightly pan-fry the pepper flakes with a small amount of oil to simulate a similar aroma. This was absolutely phenomenal! Definitely a keeper. Thank you so much for this! This is such a caring and encouraging comment. I enjoy ma po tofu very much at a local Chinese restaurant in southern Utah. Suggest you substitute Arrowroot for corn starch. Keep the ratio of water/to thickener the same. Arrowroot will thicken the sauce just like corn starch, but you will get a clear, not cloudy sauce, and it will not give you that flour taste. And the whole thing will look prettier. Yes, arrowroot starch performs better than corn starch in general. We use it from time to time too. But in general, cornstarch is much easier to find. Thanks for such a lovely comment. Prepare more rice next time when you cook mapo tofu. 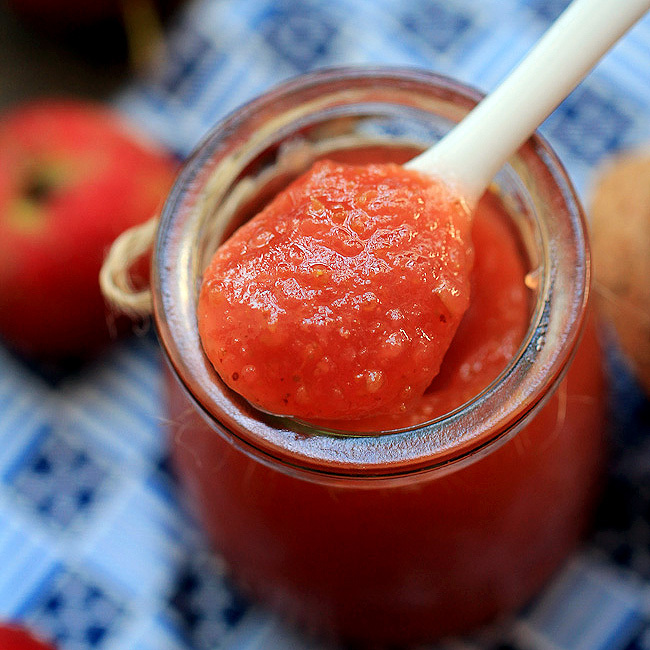 Elaine, Thanks for sharing the recipe! Tofu is a great source of Protein and I love Sichuan food. Will definitely try this one out. Wish you like it. It is one of my tofu dish. That is going to be awesome. I am going to make it for me, RIGHT NOW!!! Wow! You did an incredible job with this recipe! It’s delicious! My entire family loved it. Thanks so much for sharing! Thanks Monica. I am so glad to know it turns out good for you and your family. This is my favorite dish. I made this for my hubby.He is drooling over it.Thanks for sharing.Its easy make and delicious..
due to your excellent recipe I make this dish quite often. I have two questions, which arose from bits I gathered around the internet and I tried to make sense of them. Maybe I’m completely wrong. First it seems, that the mapo tofo is poured directly over the steamed rice for serving. This seems a little bit unusual to me for Chinese dishes, but make sense considering that you can’t really “pick up” the sauce with chopsticks. Is that observation correct? Secondly I read somewhere – and your pictures seem to support that – that this dish is mostly served with a short- or mid grain rice of the style that is used in northern China instead of the long grain rice used in the southern parts of the country. I guess this is again due to the fact that this dish has a lot of sauce which is easier absorbed by this type of rice? Hi! A few questions. What kind of oil do you recommend when you say two tablespoons of oil? Do you recommend adding Siaoxing wine? What kind of pepper flakes do you recommend and is this separate from the Szechuan peppercorn? I use several types of vegetable cooking in my kitchen, basically it should be peanut oil or sunflower seed oil. This is no particular requirement for Shaoxing wine since this dish is strongly flavored and no raw taste can be kept. But if you want to add some, spread around 1 tablespoon when frying minced beef. The pepper flakes I use is a very common one, I made my own version at home based on the instruction in how to make chili oil. Yes, it is a pure season itself and separate from Sichuan peppercorn. seems like yummy i wish to check this.